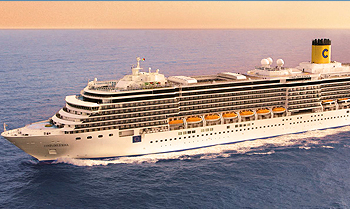 View all Costa Deliziosa cruises or view more options for Costa cruises. Golf or Grand Prix? On Costa Deliziosa, virtual fun provides incredibly real sensations. You’ll have your entire holiday on Costa Deliziosa to try out the “C” Wonders: 5 exciting activities organized to test your abilities. Virtual Golf, the most highly evolved game simulator installed on a ship. Or there’s the Grand Prix Simulator, where you can experience all the adrenalin of a high speed race for yourself. An island of five-star pleasure: Samsara Spa offers massages, treatments, therapies and oriental rituals. The feeling of harmony you experience after a treatment, massage or ancient ayurvedic ritual is impossible to describe. The aromas and scents penetrating your skin, your muscles unknotted and completely relaxed, your mind empty. In the Samsara Spa you’ll find new, intense and relaxing sensations in an intimate and elegant environment. Ask our staff to advise you on the best treatments for restoring balance and harmony to your body and transforming your holiday into a cruise of utter well-being. Cruising brings art to the dining table. Sumptuous buffets and three splendid restaurants exalt the excellence of our food. Costa Deliziosa has an astonishing range of Mediterranean and exotic flavors in store for you. Temptations and delicacies at any time of the day and late into the night. All kinds of refined dishes are available to ensure a cruise of pure gastronomic delight. Give in to every temptation: from an a-la-carte dinner in the Deliziosa Club Restaurant to the stylish Albatros Restaurant, from lunch at the Muscadins Restaurant Buffet to unmissable spectacle of culinary art at the Grand Midnight Buffet. One cruise is not enough to experience all the spectacle and seductive atmosphere of a night on Costa Deliziosa. There are 340 original works and 4,756 prints on board. The artistic project includes both young artists and great masters. Arnaldo Pomodoro’s “Sphere” is installed on Costa Deliziosa. Immerse yourself in life on board: between a drink and a swim, plenty of pampering and other activities await you, as well as a constantly changing scenery. The cruise hasn’t yet started and you’re already preparing to enjoy a freshly-made cocktail in the sunshine, perhaps sitting by the pool or lying on a comfortable sunbed. Whether it’s summer or winter, the Azzurro Blu Lido has a glass roof that opens and closes to provide relaxation whatever the season. At the front of the ship, Costa Deliziosa welcomes you to the Acqua Regina Lido, a sunny terrace looking directly out to sea and providing an exhilarating natural environment for your holiday.